Amazon.com description: Product Description: A book to help you better understand your dog...and vice versa. Tips on every aspect of dog behavior. A must for every dog owner. Illus., B&W. 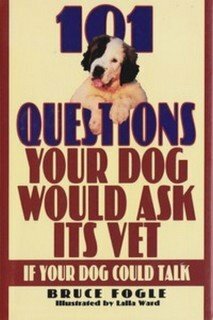 from Book Sales (April 1, 1995); titled "101 Questions Your Dog Would Ask Its Vet If Your Dog Could Talk"
About: A book to help you better understand your dog. from Diane Pub Co (March 1, 1993); titled "101 Questions Your Dog Would Ask Its Vet If Your Dog Could Talk"
from Carroll & Graf Pub (May 1, 1993); titled "101 Questions Your Dog Would Ask Its Vet If Your Dog Could Talk: If Your Dog Could Talk"